Voters who came to polling centres with temporary voter's cards could not vote as card readers did not authenticate their cards. The Independent National Electoral Commission has announced the candidate of All Progressive Congress Tunji Olawuyi as the winner of the bye election for House of Representatives in Kwara South. There was massive turnout of voters in most polling units in communities in Oke-Ero Local Government Area on Saturday. The atmosphere was relatively peaceful as voters conducted themselves orderly while security agents were seen at polling centres and some other strategic areas monitoring security. Speaking with journalists after casting his vote at Oro ward II, Onikoyi polling unit, Oro town, minister of information and culture, Alhaji Lai Mohammed, commended the conduct of the election, saying that he was impressed with massive turn out. The minister, who expressed the APC to win the election, said that people of the area were mobilized before the poll. Also speaking at Ajase Ipo ward 1, in front of Olupo palace, the PDP stalwart and commissioner for Finance, Alhaji Demola Banu, who said that the election witnessed impressive turn out of voters, however said that people complained of malfunctioning of card readers in some areas. Traditional ruler of Odo-Owa in Ekiti local government area of the state, Oba Joshua Akinyemi Adimula, condemned use of only card reader machine, saying that alternative of manual accreditation ought to be allowed. He said insistence on the card reader alone denied many people of the right to vote. 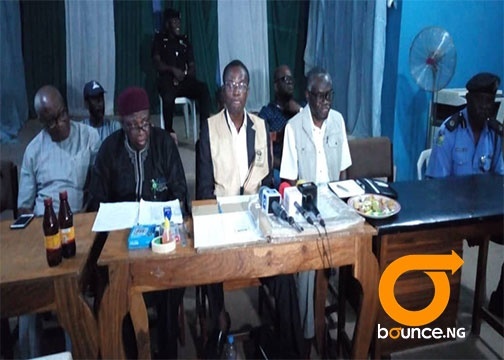 Chairman of the local government, Joseph Oni, who voted in his Idofin-Igbana community expressed satisfaction with turn out of voters and the conduct of the election. Oni, who said that there was no vote buying or any other malpractice in the exercise, explained that replacement of the machines were made by INEC officials where card readers were not functioning properly. There was however a clash among party supporters in Ekan-meje community but security agents quickly came in to douse tension. Also speaking, the Resident Electoral Commissioner (REC) in Kwara State, Alhaji Attahiru Madami, commended voters for their peaceful conduct.